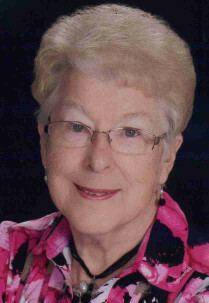 Funeral Services for Phyllis J. Praeuner, 86, Omaha, formerly of Battle Creek, will be 11:00 a.m., Friday, April 12th at St. John Lutheran Church in Battle Creek. Burial will be in the church cemetery. Visitation will begin 10:00 a.m. Friday at the church. Steffen Mortuary in Battle Creek is in charge of arrangements. Mrs. Praeuner passed Tuesday, April 9, 2019 at the Life Care Center of Elkhorn. Phyllis Jean Praeuner was born May 13, 1932 to Peter and Lula Glandt in Battle Creek. She attended parochial school and graduated from Battle Creek High School in the class of 1950. After graduation, she worked at Madison County ASC office in Battle Creek until her marriage to Howard Praeuner on May 27, 1956. They farmed south of Battle Creek until 1995 when they retired and moved to Battle Creek. She was a volunteer at Community Pride Care Center and a member of the Community Pride Care Givers. In 2000, Phyllis was honored as State of Nebraska Volunteer of the Year by the Nebraska Assisted Living Association. She also volunteered at Battle Creek Parks of Pride and served on the board and at Faith Regional Hospital, where she served on the Faith Regional Volunteer Board of Directors. She was also a member of St. John’s Ladies Aid for many years where she served as President for several terms. Phyllis and her husband, Howard, were awarded as the 2001 Battle Creek Outstanding Citizens of the Year. She was an avid flower lover and her flower gardens were visited by friends and garden clubs. She loved baking and was known for her pies and cinnamon rolls which she shared with friends, bake sales, and for benefits. Phyllis also loved to go fishing. She and Howard attended numerous local sporting events and many Nebraska football games and bowl games while their son Wade played for the University of Nebraska. She also was an avid fan of her grandson’s sporting activities and attended many of their games as well. In 2012, she moved to Omaha where she lived out her last years being active with her children and their families. She was preceded in death by her husband (Howard), parents (Peter and Lula Glandt), sister (Lois Ann) and two brothers (Darold and Kenneth Glandt). Survivors include her son Wade Praeuner (Kelley) of Syracuse, NE, daughters Wendy Bowman of Tampa, Florida, and Wanda Mullins (Marty) of Omaha, Nebraska. She had five grandsons, John Praeuner (Chelsea),Mitch Praeuner, Jakob Mullins (Kimberly) and Lukas Mullins, Chad Bowman, two granddaughters Brittni Ferguson (Andrew), Meagan Kay (Miles), two great granddaughters , four great grandsons, one brother, Ralph Glandt (Jan) of Norfolk and several nieces and nephews. Memorials requested to St. John’s Lutheran School in Battle Creek for the repair of the damage to the school gym floor from the recent flooding.